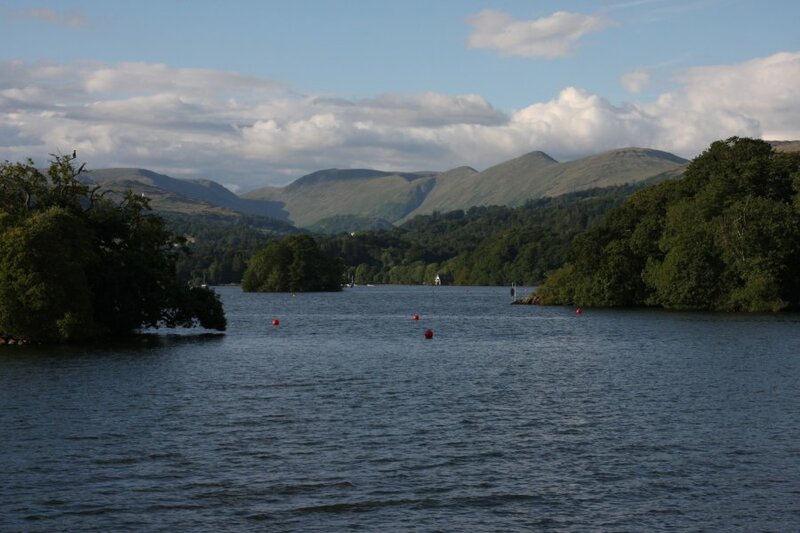 The largest lakes and tallest mountains in England. This is part one of a series of three galleries, from a multi-part holiday taking in three completely unrelated destinations. Part 2 (Isle of Man) and part 3 (Chester Zoo) can be viewed separately. 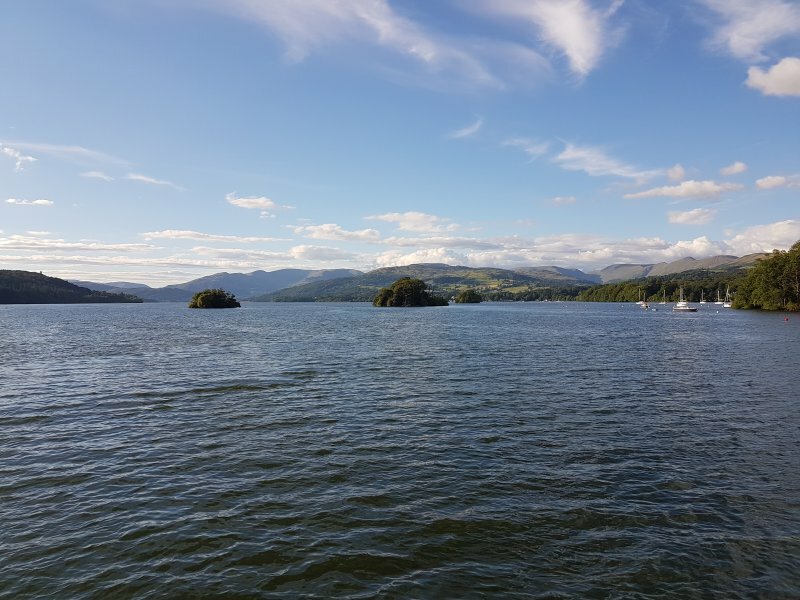 Our previous visit to the Lake District ended with us abandoning the place after suffering the torrential rain that the Lake District is renowned for. This visit was to attend a wedding. A wedding. An event notorious for getting rained on. With the date booked a whole year in advance, so the odds of it not raining were slim to nil. Talk about tempting fate. 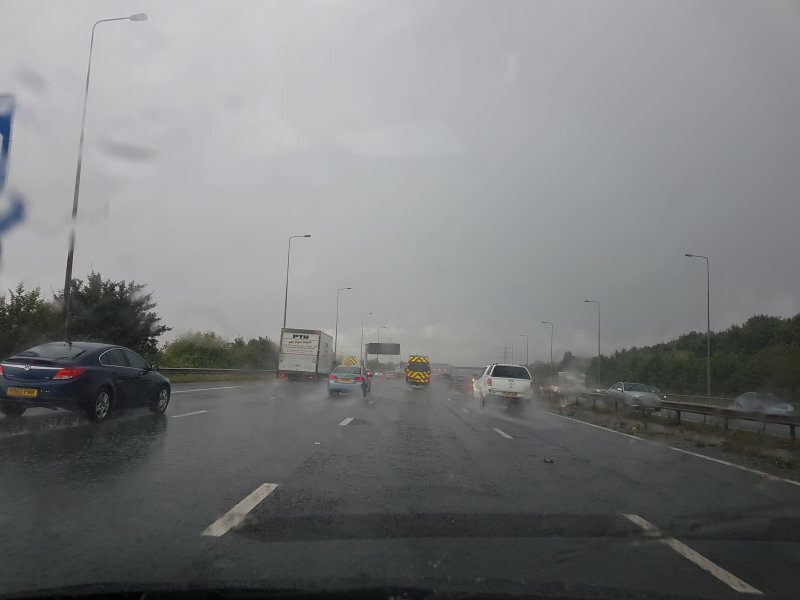 Heavy rain on the M6 near Warrington. Just as I predicted a year ago. Rain over Windermere at Bowness-on-Windermere. 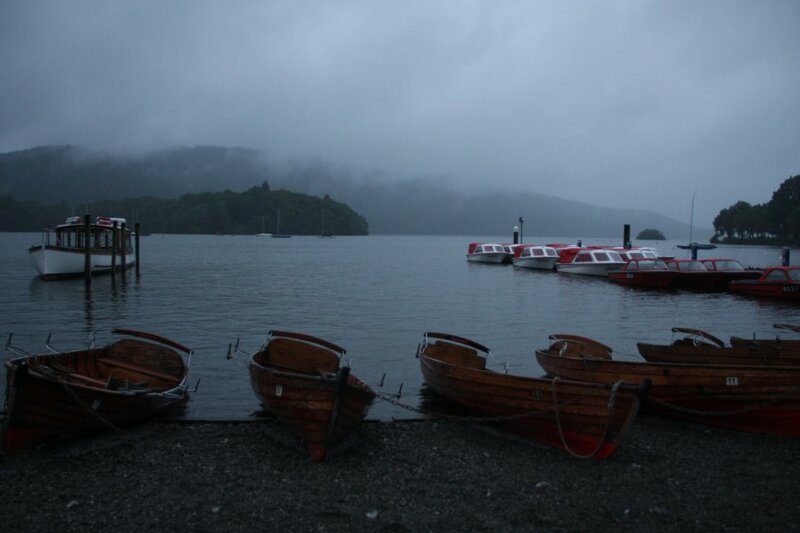 Looks ominous, and familiar; exactly how I remember the lakes. 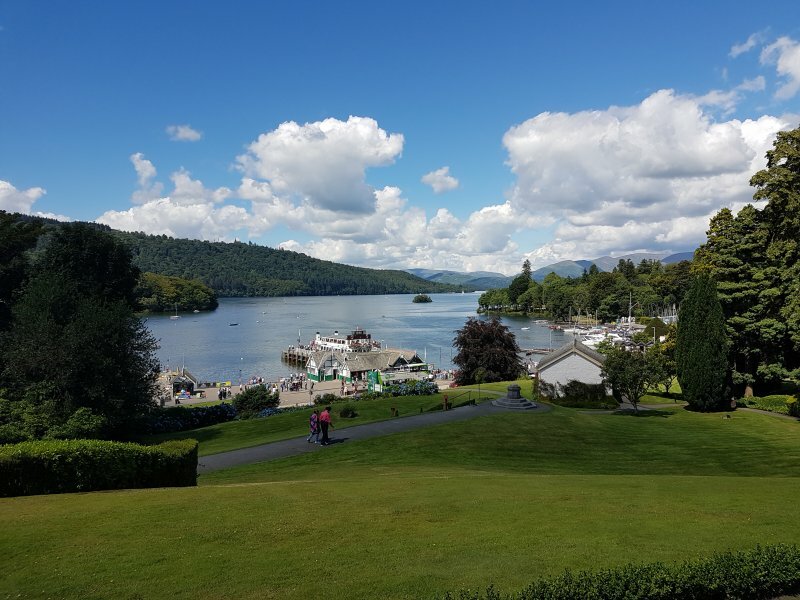 Windermere is the longest (16.8 km), largest (14.8 km2), most voluminous (314'300'000 m3), second widest (1.6 km) and second deepest (67 metres) lake in England. 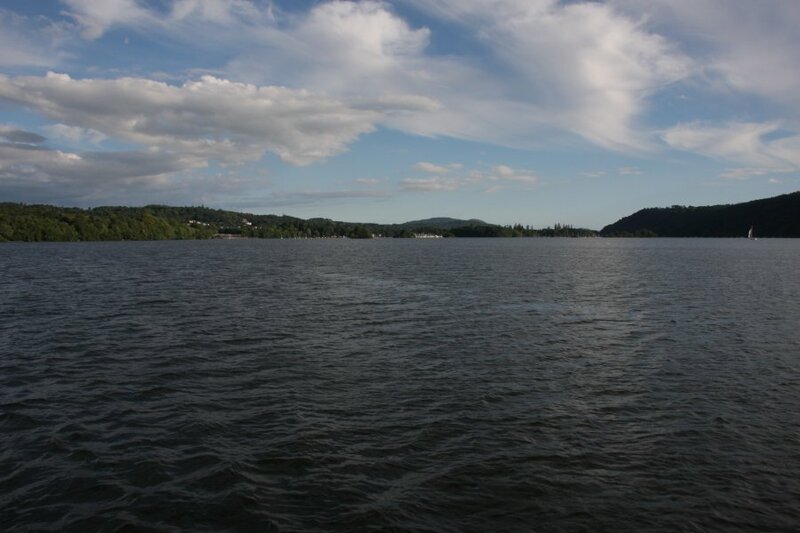 (The width is also surpassed by two reservoirs, but those are not natural lakes.) 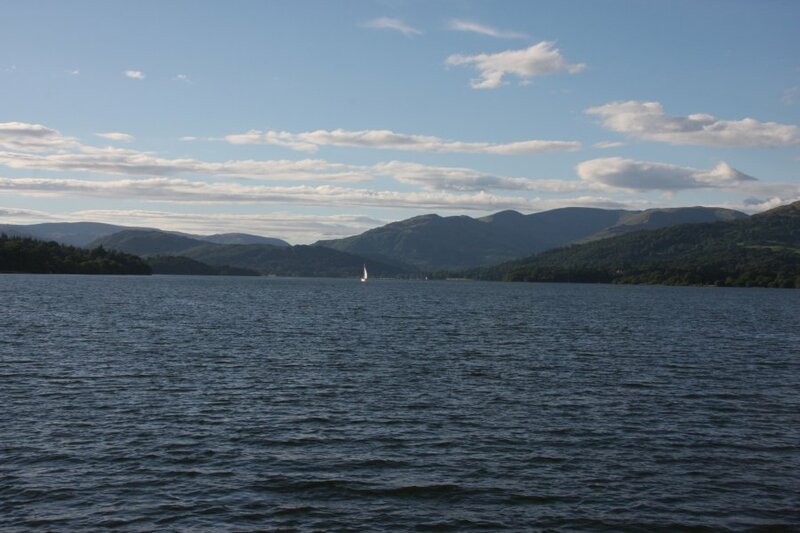 It is surpassed on all counts by multiple Scotish lakes, such as Loch Ness, Loch Lomond and Loch Morar. 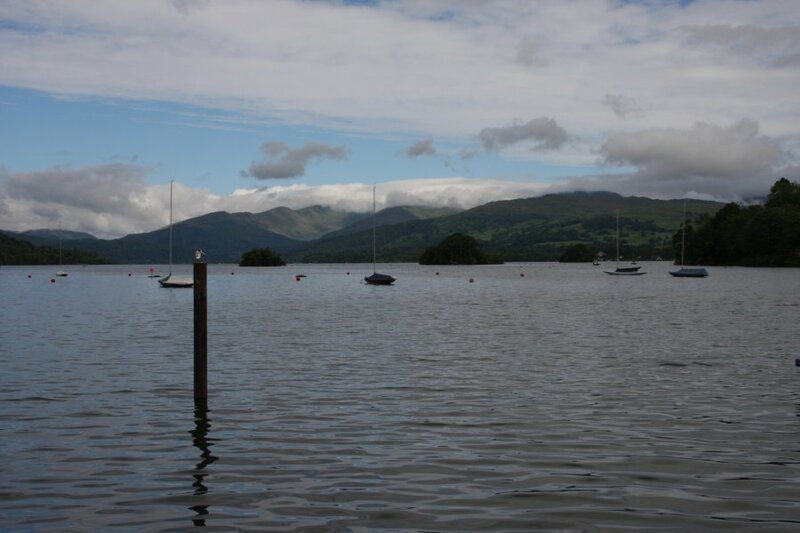 Only the depth is surpassed by a Welsh lake, and that needed to be dammed to make it deeper than Windermere. 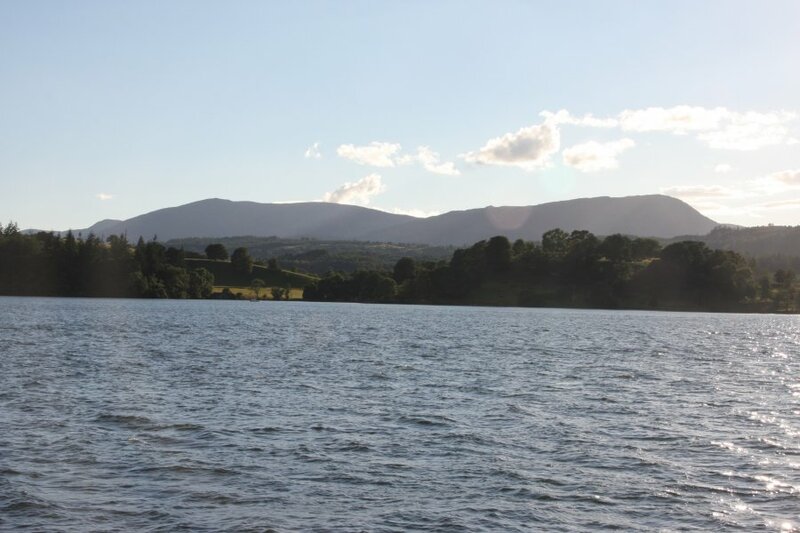 Northern Ireland has lakes such as Loch Neagh and Upper Loch Erne that surpass it in length, width, area and volume, and the Republic of Ireland has several lakes such as Lough Mask and Lough Corrib that do the same. Special for England, but there are some much bigger ones elsewhere in the British Isles. Pleasure boat on the lake. Something is wrong here; it is supposed to be raining. Steel Fell (553 metres), Heron Pike (612 metres), Heron Pike North Top (621 metres), Great Rigg (766 metres), the clouded top of Fairfield (873 metres), Dove Crag (729 metres) and its Low Pike (508 metres) ridge. Steel Fell, Heron Pike, Heron Pike North Top, Great Rigg, Fairfield, Dove Crag, Low Pike and Wansfell Pike (482 metres) and Baystones (487 metres). 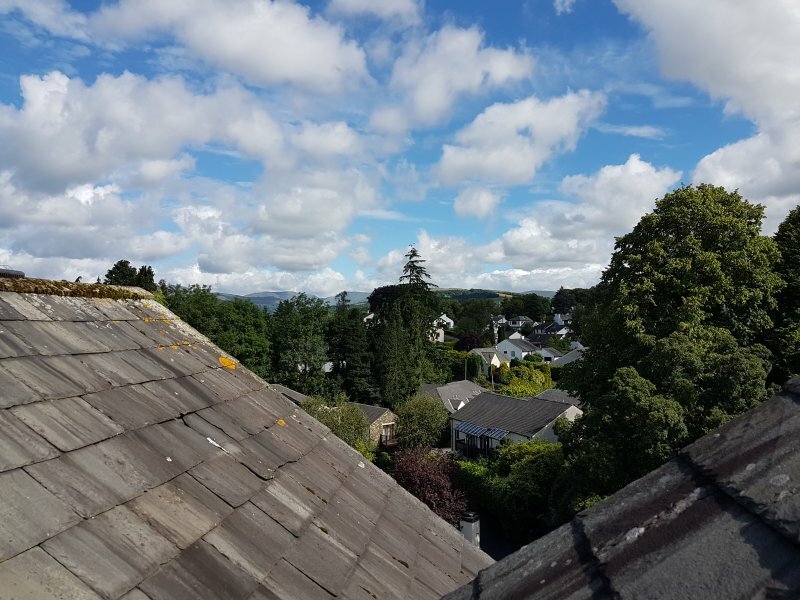 Panorama of Windermere at Bowness-on-Windermere. The green hill on the left is Claife Heights (270 metres). 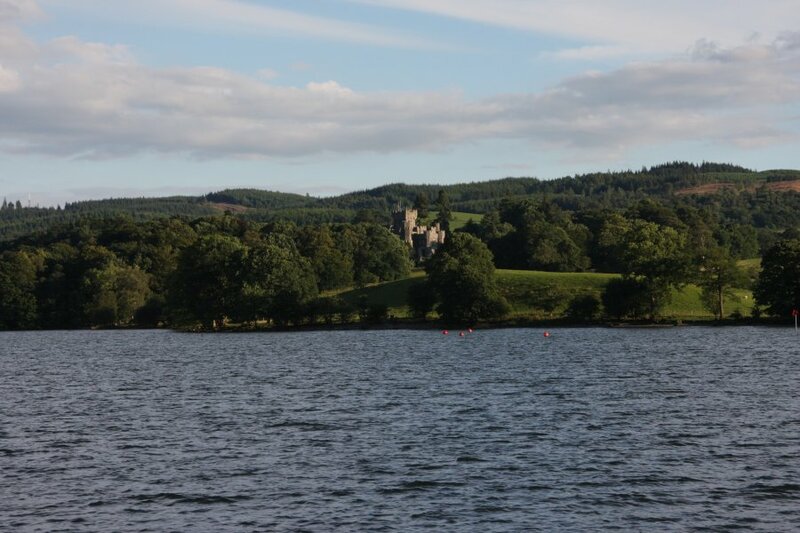 The big green island on the left is Belle Isle with Stake Holme and Fir Holme indistinguishable in front of it. The three small islands on the right are Hen Holme, Lady Holme and Rough Holme. This panorama is automatically stitched by a phone camera. The mountains from our hotel window: Red Screes (776 metres), Baystones, Stony Cove Pike (763 metres), Thornthwaite Crag (784 metres), a ridge hidden by a tree, and Kentmere Pike (730 metres). This is definitely not rain. Ullscarf (726 metres), Calf Crag (537 metres), Helm Crag (405 metres) and Loughrigg Fell (335 metres) have appeared on the left, along with Steel Fell, Heron Pike, Heron Pike North Top, Great Rigg, Fairfield and Dove Crag. Starting out onto the lake. Ullscarf, Loughrigg Fell, Steel Fell, Heron Pike, Heron Pike North Top, Great Rigg, Fairfield, Dove Crag, Wansfell Pike and Red Screes appearing together, Stony Cove Pike, Thornthwaite Crag, High Street (828 metres), Froswick (720 metres), Ill Bell (757 metres), Yoke (706 metres) and Sour Howes (483 metres). As before, with the forested Orrest Head (238 metres) on the right. Looking between Ken Holme and Lady Holme towards the Trout Beck valley, headed by Stony Cove Pike and Thornthwaite Crag. The Tongue (364 metres) appears as a little hill between them. 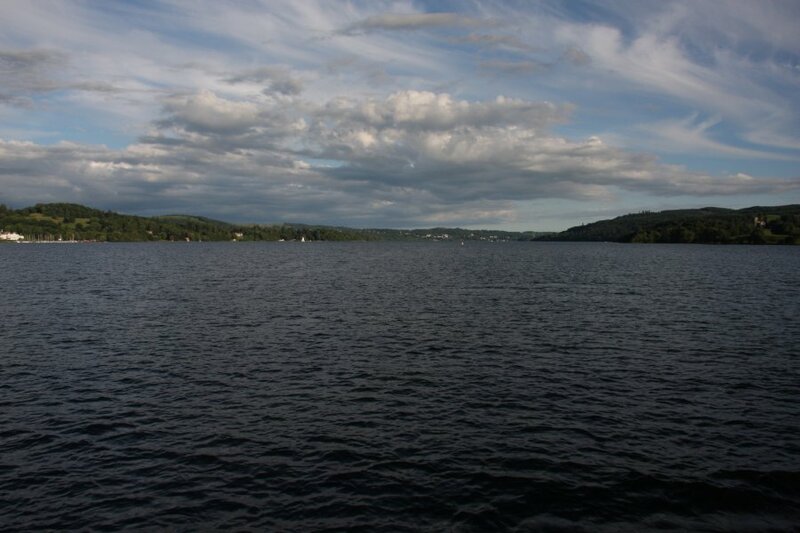 Looking towards the end of Windermere. Ullscarf, Loughrigg Fell, Steel Fell, Heron Pike, Heron Pike North Top, Great Rigg, Fairfield, Dove Crag. The Trout Beck valley and the Park Fell ridge (Thornthwaite Crag, Froswick, Ill Bell, Yoke) with High Street behind, The Tongue in front, and the Gray Crag (699 and 710 metres, with the name spelt the American way) ridge on the left. Sawtooth mountains: Cold Pike (701 metres), Crinkle Crags South Top (834 metres), Crinkle Crags Long Top (859 metres), Pike of Blisco (705 metres), Bow Fell (902 metres), Esk Pike (885 metres), Great End (910 metres) and Allen Crags (785 metres) obscured by Black Crag (323 metres) and Lingmoor Fell. Then Pike of Stickle, Loft Crag, Harrison Stickle, Thunacar Knott and High Raise. 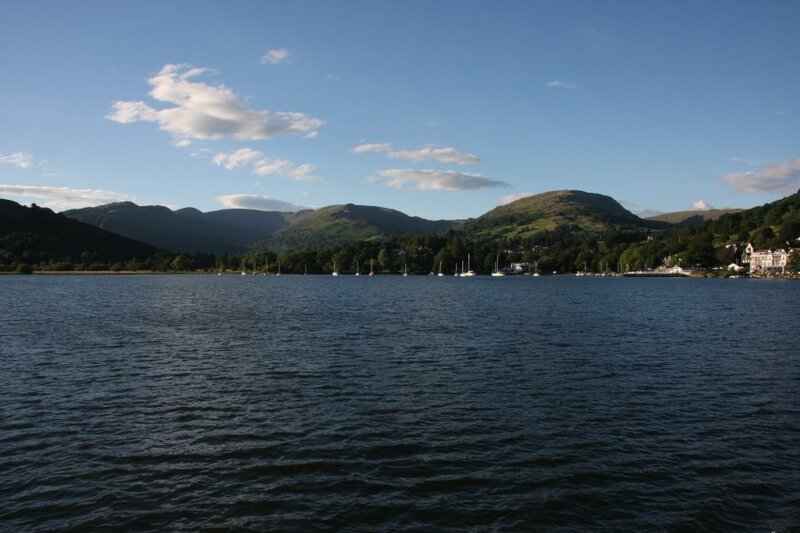 The mountains of Coniston: White Maiden (608 metres), Brown Pike (682 metres), Old Man of Coniston (803 metres), Brim Fell (796 metres) and Wetherlam (763 metres). 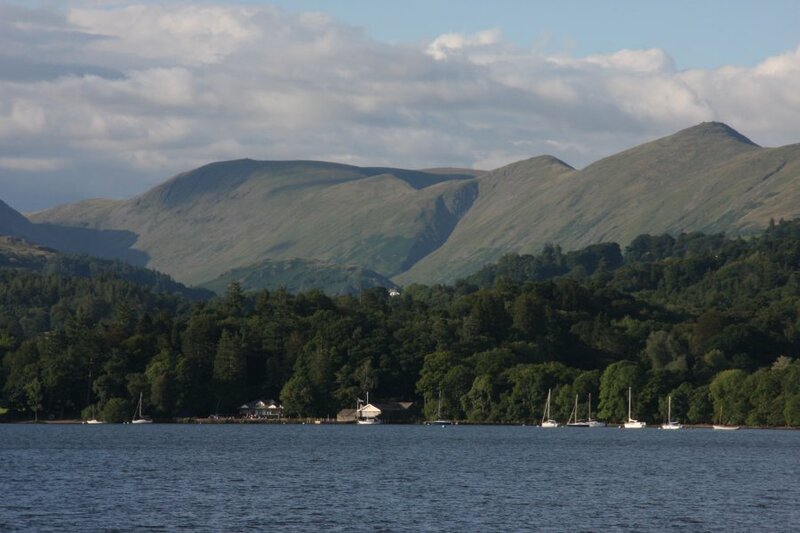 The mountains around Ambleside, at the head of Windermere: Heron Pike, Heron Pike North Top, Great Rigg, Fairfield, Hart Crag (822 metres), Dove Crag, Little Hart Crag (637 metres), Red Screes and Stoney Cove Pike. 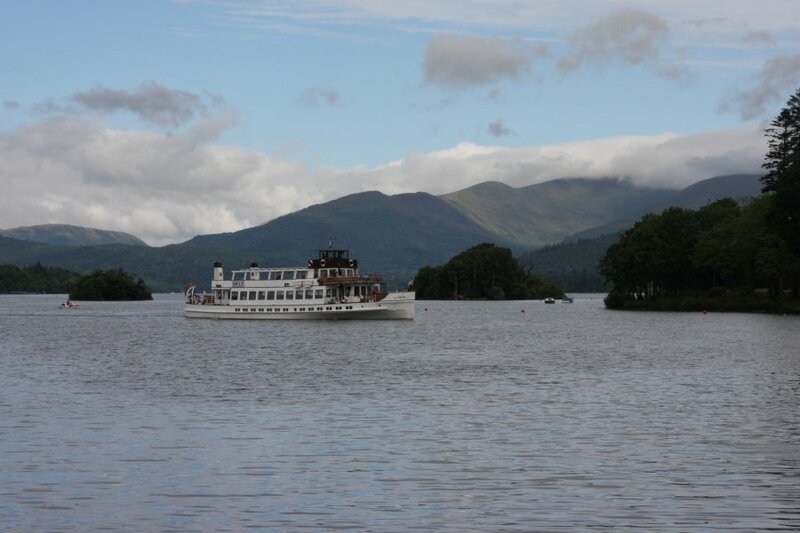 Heading back towards Bowness-on-Windermere. 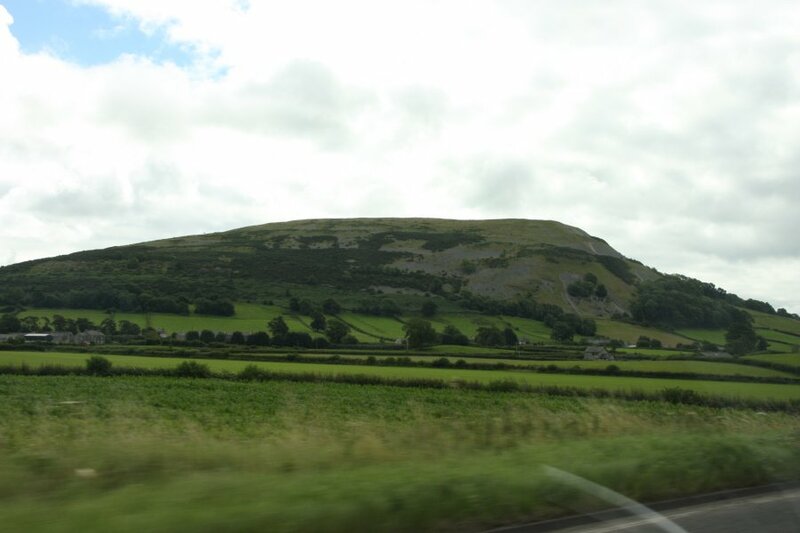 The hills are Birch Fell (318 metres) and Gummer's How (321 metres). 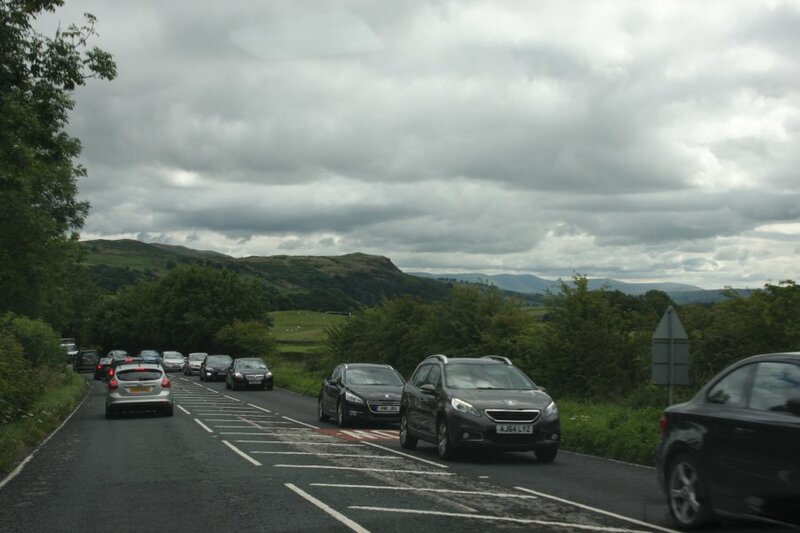 As we tried to leave the Lake District, it showed us its other ugly side; the traffic jams - it is far too popular for its roads to cope with. Miles of heavy traffic just to leave the place, and even more for the visitors heading inwards. For that distance, we were lucky to get above 15 MPH (24 KPH), and often sat at a standstill. 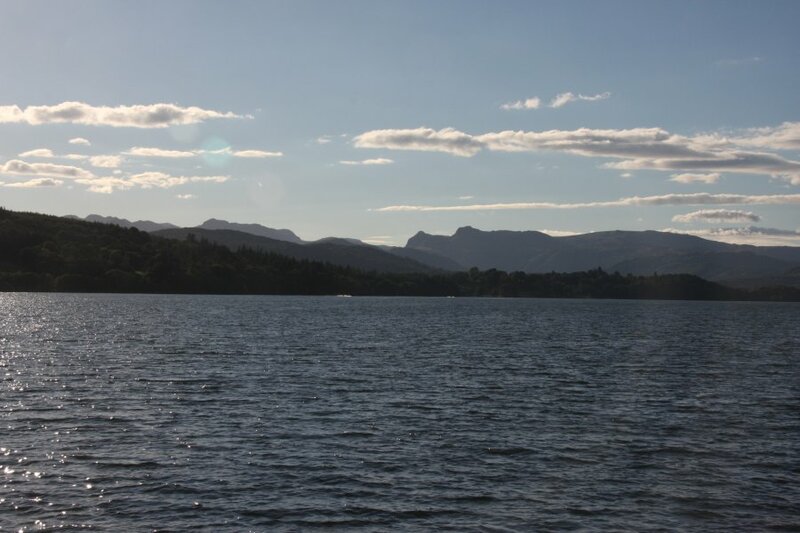 The mountains are Hugill Fell (273 metres), The Calf (676 metres), Bram Rigg Top (672 metres), Calders (674 metres), Arant Haw (602 metres) and Winder (473 metres). Mountains around Kentmere: Sour Howes (483 metres), Sallows (516 metres), Harter Fell (778 metres) and Kentmere Pike (730 metres). Reston Scar on Hugill Fell. 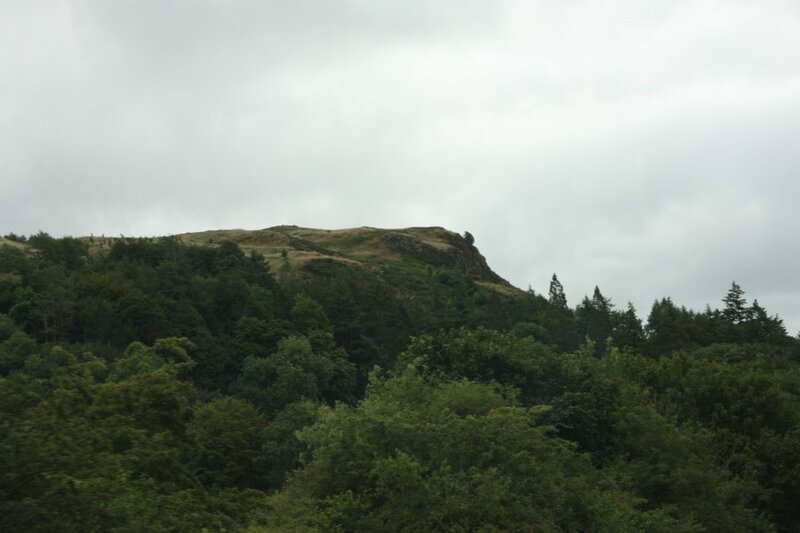 The mountains around Kendal: Greenside Crag (485 metres), Ashstead Fell (469 metres), Mabbin Crag (462 metres), Castle Fell (478 metres), Whinfell Beacon (472 metres), Grayrig Forest/Common (494 metres, and more American spellings), Uldale Head (532 metres), Simon's Seat (587 metres), Over Sale (about 530 metres), Fell Head (about 640 metres), Bush Howe (623 metres), The Calf, Bram Rigg Top, Calders and Arant Haw. 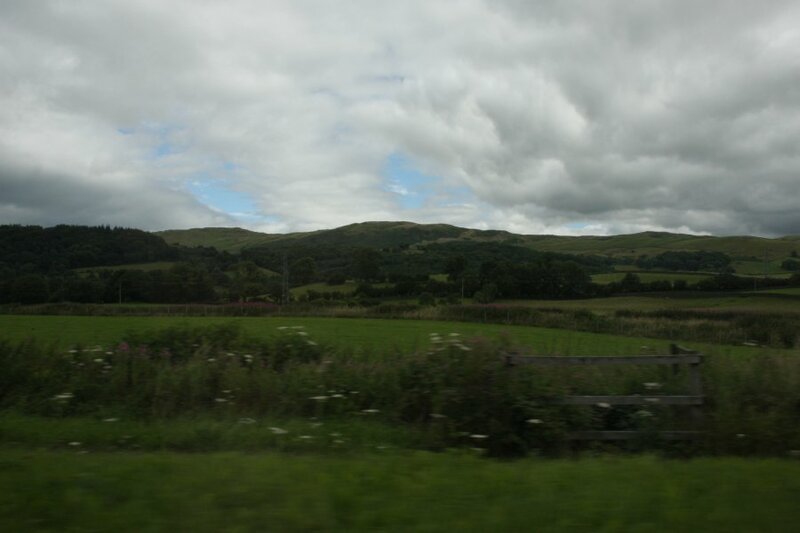 Farleton Fell (265 metres), having now left the Lake District. The Lake District from Haysham. 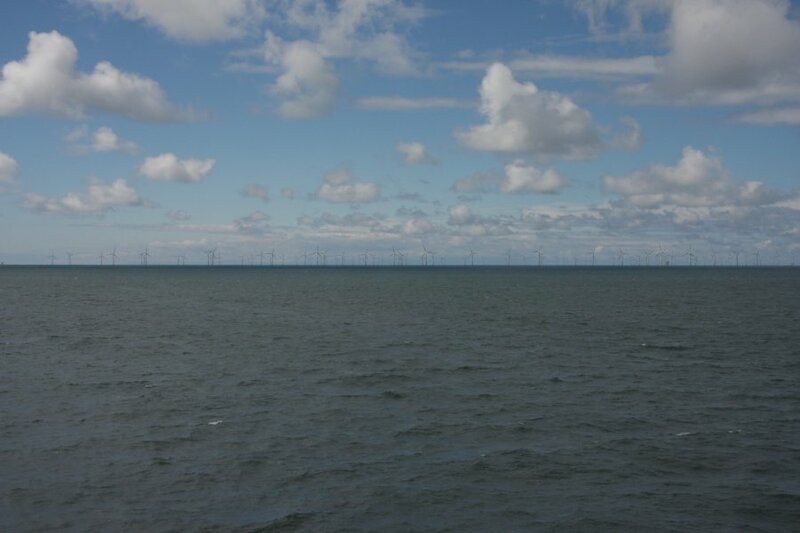 On the left is the Barrow-in-Furness peninsula. Scafell Pike (978 metres) - the highest mountain in England, but surpassed in both Wales and Scotland - sits in the cluster of large mountains about a third of the way across the picture. Windermere sits in the low area to its right. In the next low area is Kendal. The hills on the right are the Yorkshire Dales. This panorama was automatically stitched by Microsoft ICE, since it was 9 pictures long, and I was feeling lazy. 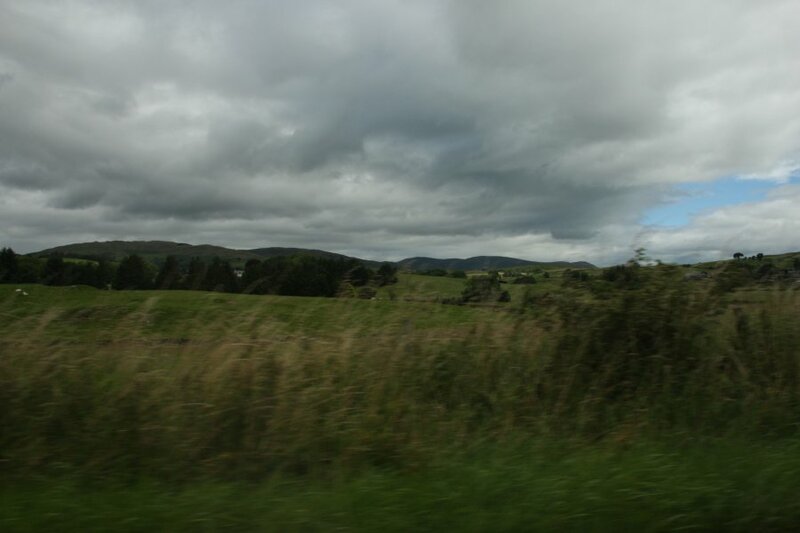 A final view of the Lake District, Yorkshire Dales, and the Forest of Bowland. This panorama was also automatically stitched by Microsoft ICE, since it was 11 pictures long, and I was feeling even lazier. 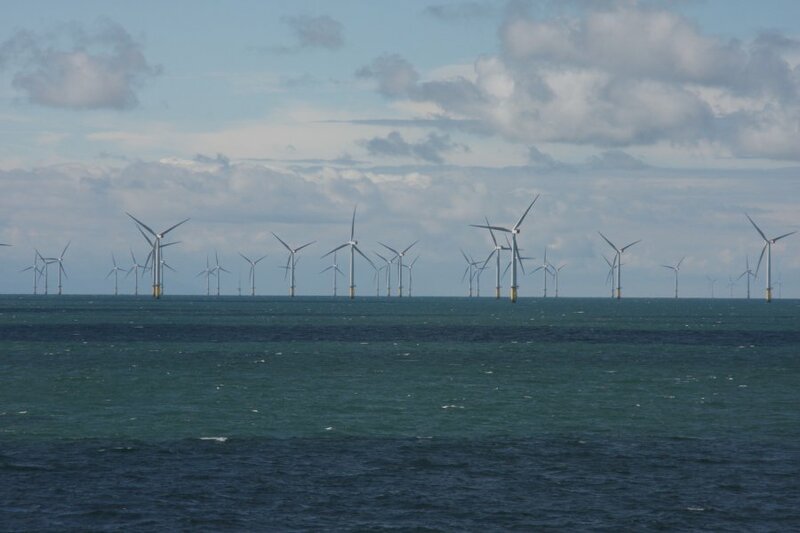 Approaching the massive Walney Wind Farm - this is probably the part known as West of Duddon Sands Wind Farm, and is actually quite small for the area. 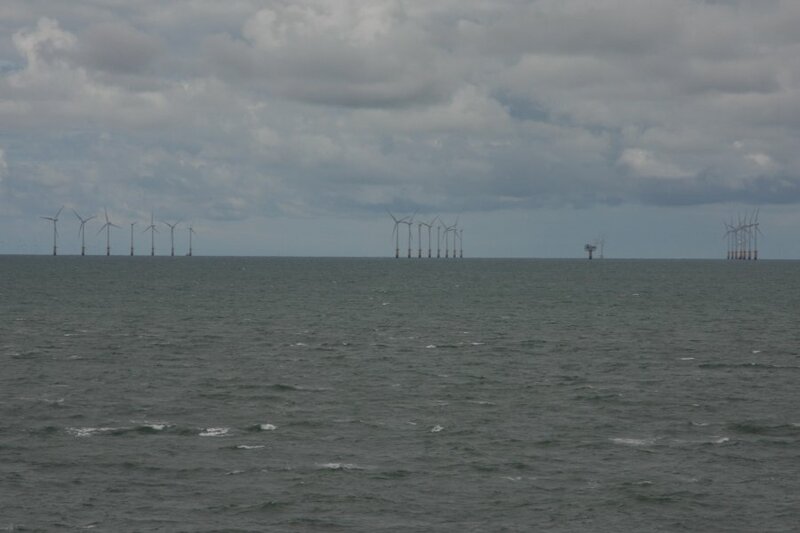 Walney Wind Farm, in the Irish Sea. Simply enormous, with its 102 wind turbines going off into the distance (there are plans to more than double its existing size). This is how to do wind farms; without damaging the boglands of the mountains, and without blighting the landscape. As a nation, we have so much coastline, and this puts it to good use.